Save on Durable Pro Stock Maple, Birch, and the talk of ball players in the know "American Beech Wood Bats"
Made from high quality dense Beech Billets, these bats enable batters to prove themselves. The natural wood sap fills in the microscopic fiber matrix when dried causing a denser wood than maple, ash and birch. The beech bat surface will compressed with every hit and then rebound when the bat ball contact is made . Beech bats will have more flex allowing a stronger whipping action when hitting a baseball. Higher Batted ball exit speed (2-3 miles per hour) which will give added lift with our use of BATLAC Finishing. A denser wood will vibrate less thus providing more ball bat explosion on contact. 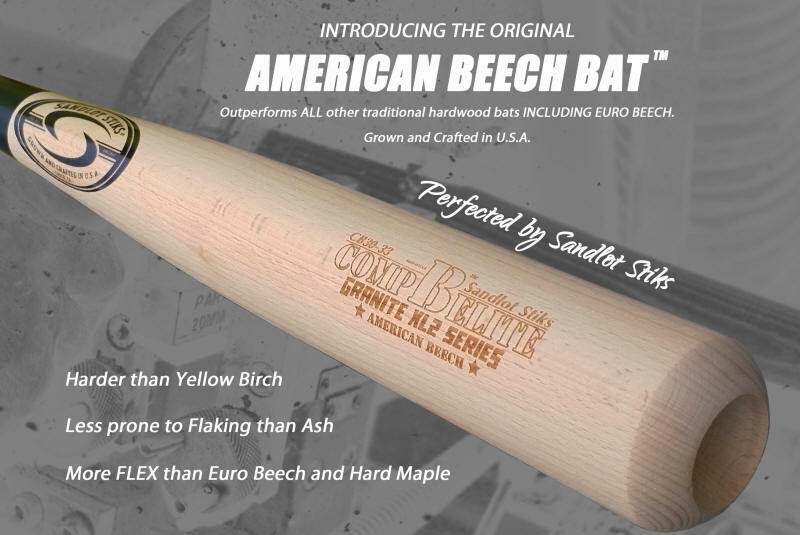 American Beech Bats made here in America are always delivered freshly made. more crisp, the ball harder hit, and just darn angry coming off anywhere near the sweet spot. Why we Sell Wood Bats...Because the Rule Book says to! That's how baseball's played! Why is high density better? It's all simple physics really. Without getting too technical; density is directly related to mass and mass is directly related to force. Force directly impacts the ball flight of a batted baseball. Dense wood has more mass and weight at the point of contact with a baseball which in turn transfers more force to the batted ball. The result can create longer ball flights and higher ball exit speeds on average. More importantly dense wood tends to hold up to repeated impact better than lightweight wood. But not all dense woods are proper for baseball bat production and not all dense wood bats are designed properly for maximizing swing speed. The HDX Series bats are manufactured from ideally processed High Density North American Hard Maple logs and have been designed for a manageable weight range and balance to help improve bat speed, control and durability. The HDX Series bats are consistently similar in weight to the standard modern high school and collegiate metal bats available today and come cupped as a standard to optimize balance. It's all in the design of the bats and processing of the lumber from which they are manufactured. Anyone can take a piece of wood and make it look like a baseball bat, but what makes one piece of wood ideal for the abuse of repeated impact from batting pitched baseballs and how to make it into a bat you can swing effectively is a whole different ballgame! It takes years of experience producing wood bats to gain the knowledge to know what the right wood is, we have it. It also takes experience of playing the game at the elite levels to understand the mechanics of a baseball swing and how to properly design bats to execute that swing. We have that too! Now we're going to pass it all on to you. NEW BATLAC Bat Finish proprietary “GREEN” BATLAC TM H2O waterborne topcoat with "Backspin Technology" designed specifically for use on wood baseball bats. The all new FULCRUM M5 is the latest in HDX Technology by Sandlot Stiks. We’ve taken our already ridiculously hard HDX TIMBER and produced another fantastic model. The FULCRUM M5 was designed by Chris Corso to utilize our Trademark "HDX" (High Density X-treme) timber while keeping a manageable swing weight. The OVERSIZE tapered knob adds comfort and protection against hamate bone injury all the while functioning in combination with a cupped modest diameter barrel as an OPTIMAL-BALANCE to the ultra hard and dense timber. We then reverse dip the FULCRUM M5 bats in our already proven BATLAC Burgundy finish which adds another element to balance weight from the barrel to the handle. The balance point or “Fulcrum” is thus shifted to the perfect area of the bat for maximizing swing speed optimizing moment of intertia and transferring more mass and energy per square inch to the baseball. The result is a ZERO WEIGHT DROP bat which swings like a -3 and produces upon ideal impact a far better ball exit speed and ball flight distances than the normal -3 weight drop wood bat. The FULCRUM M5 utlizes the most dense material we offer for added baseball crushing stone like surface hardness. Junior Tournament version of the adult model 141 J for youth and little league, a long time favorite of Sandlot Stiks founder and CEO Chris Corso, the model 141JT features a conventional knob, .945" handle, and long 2.22" barrel. This smooth swinging bat is one of two Junior Tournament models we offer, the other being the 271JT. Available in 28, 29, 30, and 31 inches. Junior Tournament version of the adult model 271 for youth and little league. The 271 J is by far the most widely used wood bat shape in all of baseball. Hitters of all types have used this design for many years, most notably it was the bat used by Ken Griffey Jr. for the duration of his baseball career. The 271JT features a .925” handle with a flared knob and long tapered 2.22” barrel. This smooth swinging bat is one of two Junior Tournament models we offer, the other being the 141JT. Available in 28, 29, 30, and 31 inches. All PRO XL2 Maple game bats are available in 1/2" increments from 32"-35" and -3 or higher weight to length ratio. Because we have chosen our models carefully we can generally meet the weights without the need for a cup. However we can remove up to .30 of an ounce using a 1.5" diameter cup without compromising barrel end integrity. Models M205 and M331, 34" or larger come standard with cupped ends. "With all the latest developments in the wood bat industry over the past ten years or so, all the focus has been placed specifically on designing a better construction of the wood bat. We have taken this one step further and developed a better coating to go with a better wood bat "says Corso. With the help of Matt Ceriani of the Edmonton Capitals Professional Baseball Club and Mac's Professional Baseball School in Chico, CA, Mr. Corso has developed BATLAC TM H2O waterborne topcoat with "Backspin Technology" designed specifically for use on wood baseball bats. "The flight of a baseball is directly impacted by the way the ball spins after it comes off the bat. Studies have proven several key factors control what makes a ball travel farther when hit. Bat speed, undercut (where the ball is contacted in relationship to its center), ball exit speed, trajectory, and backspin. The pitch of course also helps determine how far a ball can be hit. It has been proven under optimal conditions a seventy-eight MPH curveball can travel farther than a ninety-four MPH fastball when hit. This is due to a higher rate of backspin. The spin of a curveball is augmented when hit with backspin by up to 800 RPM. A fastballs spin must change direction when hit in order to create backspin. A bat surface with a high coefficient of friction will help create more backspin thus helping the ball lift, travel straighter and with less wind resistance, resulting in more distance."" MLB has asked that it’s approved bat manufacturers place the label of the bat on the vertical grain or longitudinal axis of Maple bats because they say this is the weaker side. This of course goes against 100+ years of traditional belief that the longitudinal axis is the stronger of the two sides. MLB says through the studies performed on bat breakage in 2008 it has been proven Maple bats will have a tendency to break less violently when hit on the flat grain or Tangential axis side. In addition the strength of the Maple wood is up to 30% stronger on that Axis. Ash wood is ring porous and has an open grain, which gives the layers of wood a tendency to separate if struck against the tangential or face grain. So hitting on the longitudinal grain makes more sense. Maple is a diffuse porous wood and has very uniform structure and tight grain. Under a microscope it looks like a 3D traffic grid. The fibers of Maple are short and rigid, thus the main concern with maple is that it often breaks in half or multiple pieces causing very dangerous spear like projectiles. “If it means having a safer product, we’ll conform to the new MLB rules too” says Corso. “We have always been very discrete in choosing a straight grain for all our game bats because this makes for a stronger bat. Since our inception in 1996, we have enforced a strict quality control incorporating most importantly the Zero slope of grain idea for our lumber. We have always made sure our suppliers either Split our billets or saw for grain and fiber straightness with very little to no slope of grain. Multi-piece fractures a far more likely to occur when the wood rays or fiber direction is at an angle or not parallel to the center of the wood. When hardwood logs are split, they will split along the direction of these fibers creating the straightest possible grain in both the longitudinal and tangential directions. When logs are sawn, they may be sawn at an angle to those fibers of the tangential axis creating a weak fiber direction. An ink dot will now be placed on the Maple and Birch bat handles at the 12" mark. The ink will bleed into the fibers of the grain and run along them revealing the direction or slope of grain”. “For Maple wood especially since it has a natural tendency to be more brittle than Ash, Birch and Beech due to its short rigid fibers, the grain in both directions need to run as parallel as possible to the center of the piece of wood for the entire length of the bat. This will insure optimal strength of the wood. Even though we were aware of this in the past and made sure our bats had strict grain standards, we were not aware of the strength difference between the two directions of grain. All our new Maple and Birch bats will have labels on the longitudinal grain, but will keep the labels on the traditional face grain for Ash bats due nature of the wood itself."